With all the cold, of course it seemed like the perfect time to use this little penguin image. I used some papers from my stash and voila! Instant card!! I'll be using this one to send to a little boy. Thanks for stopping by today!!! God bless you!!!! Oh how cute! Love the darling penguin image and our blue card is perfect for the inspiration photo. Zella, I just love all the different papers you've used on this creation. Looks totally awesome! The little boy who receives it will just love this! Very sweet image, and I love all your blue patterned papers! What a great project, very cute!! We appreciate you taking the time to join our January Photo Challenge at CTB! Thanks for joining us this week for our Photo Inspiration Challenge at Bugaboo's Catch the Bug blog and good luck in the draw. Please join us again soon! 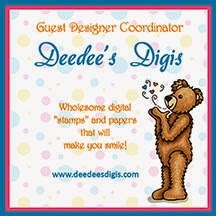 such a cute card, thanks for playing with us this week at papermakeupstamps.